Convict transportation was conceived as a relatively easy means of emptying British prisons and punishing repeat petty criminals without having to resort to a death sentence. 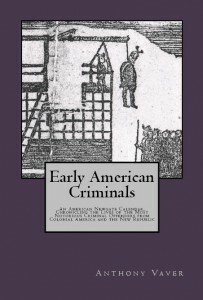 Most convicted criminals facing potential execution were probably relieved to receive a reprieve from death in exchange for servitude in the American colonies. 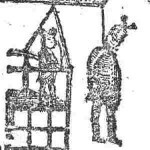 There are a few cases, however–Philip Gibson, who was found guilty of highway robbery in 1751, being one–where felons refused to be transported, preferring death instead. As an alternative to corporal punishment (whipping, branding, burning in the hand, etc. ), transportation was generally regarded as a less humanitarian and more severe form of punishment. Even though transportation was supposed to serve as a more lenient sentence in cases that would normally call for execution, those caught committing petty crimes were no doubt stunned to learn that their measly acts earned them enforced transportation and servitude in a far-off land. 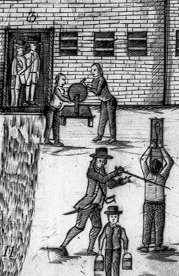 While languishing in Newgate or other English prisons awaiting transportation, some convicts tried to appeal their sentences in a desperate attempt to avoid being shipped overseas. The following three convicted felons all show willingness in their petitions to exchange their sentence of transportation for corporal punishment. Elizabeth Howard of St. Bride’s was found guilty of stealing 3 yards of ribbon and a piece of silk lace from Thomas Worsley. The stolen items were valued at three shillings and two pence, but the jury reduced the value of the goods to 10 pence, so that she could receive a reduced sentence of transportation. The fact that Howard was only 12 years old at the time must have entered into the jury’s decision. That your petitioner being disguis’d in liquor was guilty of committing a crime which she never before did and hopes by the grace of God never to do the like again. Your petitioner since her unhappy confinement in goal has lost the use of her limbs. Most humbly prays on the account of her tender age not yet thirteen years and only cast to the value of single tenpence that your Honour out of your extensive goodness will be pleas’d to let her receive corporal punishment here for the heinousness of her crime and not to transport her out of her native isle. And your petitioner as in duty bound will ever pray etc. The petition seemed to have had its intended effect. Howard was ordered to be discharged on account of her age, but she died in prison before she could be released. On 17 May 1727, John Wilson, alias Smith, of St. Mary Wallbrook was accused of stealing a padlock from a warehouse door. Two watchmen stopped and searched him on suspicion of seeing him and another man take the padlock. The other man got away, but the watchmen found eight picklock keys on Wilson. The padlock was later found in the Channel, after Wilson had tried to rid himself of the evidence. In the present case, the court agreed that Wilson intended to rob the warehouse, but the jury only found him guilty of stealing the padlock, and he was sentenced to transportation. It did not take him long to appeal his sentence to Sir John Eyles, the Lord Mayor of London. that your petitioner was try’d yesterday at the Old Baily for a padlock value two shillings and found guilty. That your petitioner is now in the sixty sixth year of his age his eyesight much decay’d and wounded in both his hands in her late Majestie’s service at Vigo, being then a Soldier in the Lord Cutts his Regiment in Colonel Bissetts Company, hath now a poor wife and two children. Therefore your lordships poor petitioner most humbly prays your Lordship that in consideration of his great age, his wounds and bodily infirmities together with the smallness of the crime laid to his charge, that your Lordship will be pleas’d to inflict such corporal punishment in lieu of transportation as your Lordship and the Honourable court shall think meet. And your petitioner as in duty bound shall ever pray etc. Wilson’s petition didn’t work. He was placed on board the Susannah and sent to Virginia in July, 1727. James Barton of St. Dunstan’s in the West, was indicted on 9 July 1729 for feloniously stealing three pounds and eight pence worth of goods from John Amos and Charles Edgerton. The jury found him guilty, but, as in the case of Elizabeth Howard, they reduced the value of the goods to ten pence. As a result, Barton was sentenced to transportation. With the help of several friends, he also petitioned to have his sentence changed to corporal punishment. that your petitioner is a young man come of very wealthy and honest parents who are now dead, had a plentifull fortune to begin the world, but by loss in trade, fail’d and has since been as a journeyman to Messrs. Egerton and Amos haberdashers of small wares, the prosecutors. He took from them a small quantity of thread without their knowledge, in order to support his wife that was then big with child and two children. His wife is now dead and one child, since his sentence last sessions for transportation. Your petitioner having several friends who are ready to give security for his future good behavior. That the prosecutors having suffer’d no loss the thread being restoar’d to them without any diminution. Your poor petitioner therefore humbly hopes and begs as this being the first fact he ever was guilty off, you will be pleased to order him corporal punishment, that he may not be forced into forreign parts, but remain in England. We whose names are hereunto set have known the petitioner and his family many years during all which time the petitioner has behaved very honestly and we believe this to be his first offence. This petition worked. Barton’s sentence was changed to a whipping on 29 August 1729. Barton then posted bail with the court and was ordered to remain in Britain for three years. This post is particularly indebted to Kenneth Morgan’s work. Coldham, Peter Wilson. “The Complete Book of Emigrants, 1607-1776.” Baltimore, MD: Genealogical Publishing Co., 1996. —. The King’s Passengers to Maryland and Virginia . Westminster, MD: Heritage Books, 1997. Ekirch, A. Roger. 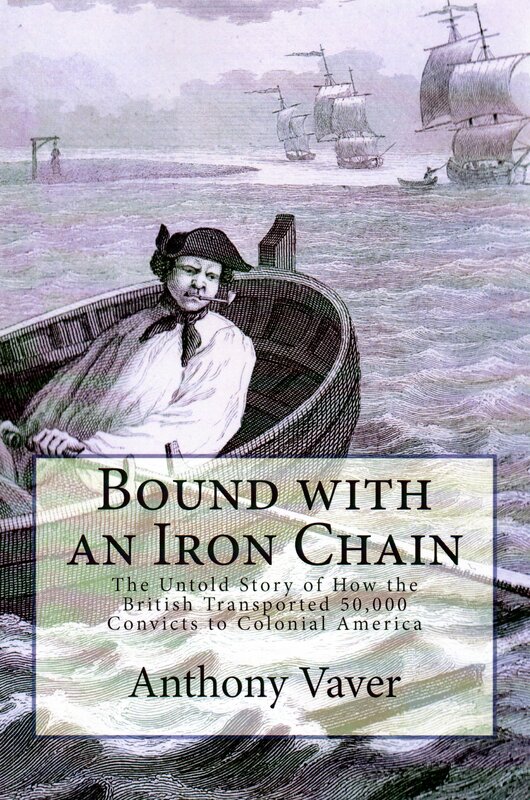 Bound for America: The Transportation of British Convicts to the Colonies, 1718-1775. New York: Oxford University Press, 1987. Linebaugh, Peter. 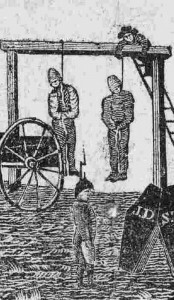 “The Tyburn Riot against the Surgeons.” Albion’s Fatal Tree: Crime and Society in Eighteeth-Century England. Ed. Douglas Hay, et. al. New York: Pantheon Books, 1975. Marks, Alfred. Tyburn Tree: Its History and Annals. London: Brown, Langham, 1908, pp. 221-223. Internet Archive (22 January 2009): http://www.archive.org/details/tyburntreeitshis00markuoft. Morgan, Kenneth. “Petitions against Convict Transportation, 1725-1735.” The English Historical Review 104.410 (1989): 110-13. [News item on Philip Gibson]. The London Magazine or Gentleman’s Monthly Intelligencer, Vol. 21, 1751, p. 427. The Hathi Trust Digital Library (22 January 2009): http://catalog.hathitrust.org/. Old Bailey Proceedings Online (www.oldbaileyonline.org, 22 January 2009), May 1727, trial of John Wilson (t17270517-1). Old Bailey Proceedings Online (www.oldbaileyonline.org, 22 January 2009), December 1728, trial of Elizabeth Howard (t17281204-37). Old Bailey Proceedings Online (www.oldbaileyonline.org, 22 January 2009), July 1729, trial of James Barton (t17290709-60). Old Bailey Proceedings Online (www.oldbaileyonline.org, 22 January 2009), August 1729, supplementary material, James Barton (o17290827-3). Old Bailey Proceedings Online (www.oldbaileyonline.org, 21 January 2009), May 1751, trial of Philip Gibson (t17510523-25). This was written by Anthony Vaver. Posted on Thursday, January 22, 2009, at 5:17 pm. Filed under 4. Convict Voyages. Tagged Convict Transportation, Criminal Justice System - England, Prisons and Jails, Robbery, Theft, Whipping. Bookmark the permalink. Follow comments here with the RSS feed. Post a comment or leave a trackback. How can I find out if my ancester came to Amercia as a convict? The best source is Peter Wilson Coldham’s “The Complete Book of Emigrants, 1607-1776,” which is available as a CD-ROM, or his “King’s Passengers to Maryland and Virginia.” You can try asking a reference librarian at your local library for help in locating a copy of either resource. If you know that your ancestor was originally from London or its surrounding counties, you can try searching in the Proceedings of the Old Bailey (www.oldbaileyonline.org) to see if his or her name pops up. Full bibliographic information on all these resources are listed in the Sources section of this post.